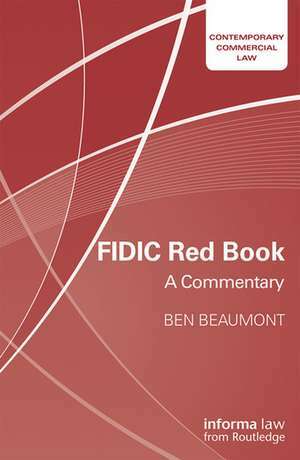 Written by a member of the FIDIC President’s List of Adjudicators, this detailed and critical commentary on the FIDIC Red Book provides authoritative guidance and recommendations for best practice. Focusing on each clause of the Condition of Contract, this book identifies pitfalls and logistics issues associated with its enforcement and ancillary processes, to give readers an advantage when operating with the FIDIC Red Book. Intended to promote the best use and growth of FIDIC, this guide will be essential for all users of the FIDIC Red Book, be they contractors, lawyers, engineers, students training to join these industries or any professional involved in the resolution of dispute involving the FIDIC Red Book. Editura: Taylor & Francis Ltd.
Ben Beaumont is a barrister. In addition, he is a chartered surveyor, FRICS, FCIArb and a Chartered Arbitrator, as which he has more than 30 years of experience. He was a member of the original Marriott committee which was drawn together to draw up the predecessor to what is now the Arbitration Act 1996. He has adjudicated and arbitrated disputes arising from the FIDIC Suite of Contract Conditions. He sits regularly on DAABs in most jurisdictions.